I just followed my own advice from the last post and managed to purchase a new lawn mower at a considerable discount at Lowes. Unfortunately there are no more left at the store I went to but you never know if there will be others. There were about 5 lawn mowers left when i bought mine. The curious thing is that I cannot find it on any web site, even the manufacturers. It is very similar to the Model 44M9 on the Yard Machines web site, however it differs in three major areas. First it is a 22 inch wide lawn mower and secondly it does not have a rear bag attachment for catching the grass. You can either use this lawn mower as a mulcher or a side discharge, which is fine with me. The last major difference that we could see is that it has an old fashion choke instead of an auto choke. The picture on the left is exactly the same as mine, without the grass catcher on the back. It works fine, you just have to remember to open the choke when you start it cold and close the choke once it is running. The choke is located on the push bar handle within easy reach. This is a really great lawn mower. I have cut the lawn several times and really enjoy the self propelled feature and also not having to bag the grass! Here are the specs for the machine we purchased. AutoChoke – no priming. Just pull and start. Overhead valve engines run more efficiently and produce fewer emissions than the standard L-Head engines. Warranty: This lawn mower comes with a 2 year limited warranty. We are very satisfied with this lawn mower. It starts the first time every time. It is easy to steer and control with the self propelled feature and it mulches the grass very well. I usually keep the self propelled feature engaged and just lift the front wheels a bit if I need to slow down or turn a corner. This lawn mower is 22 inches wide, which is 2 inches wider than my old lawn mower and I do not have to bag the grass either. I save a lot of time as a result and I am saving on the cost of paper bags which we fill each week and put out to the curb. Saves me money and saves the city the cost of having to pick up my grass clippings! All I had to do was add the oil to the engine from the bottle of oil that was included with the lawn mower, fill the gas tank with regular gasoline and start it. I have checked the oil level a few times since and it is still at the right level and clear as when I first put it in. 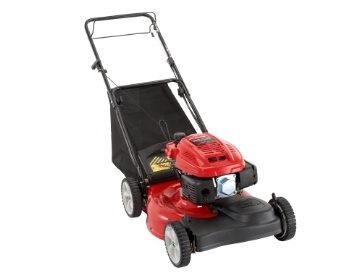 Delivery: Most lawn mowers can be picked up in the store, however if you do not have the means to take it home yourself, delivery usually can be arranged for a delivery charge. You may want to consider borrowing a trailer or a van to bring home your lawn mower and avoid the delivery charge. I was able to just get the box into my trunk with the trunk lid left open. Fortunately I did not have to far to go to get home.